Extreme virtual flight, epic air battles of detailed beauty of landscapes; 3 PvP mode, and PVE mode - all this awaits you in the game War Thunder, join! Presented session airline simulator takes delight all lovers of realistic MMO games will give the opportunity to master the skills of aircraft control, to examine (and for those who want - and rewrite) the history of the Second World War. In order to start the game - you have to go through a brief registration procedure War Thunder, for which you will need to fill in three fields: username, password, and email address. On the mail will receive a letter about the activation of the game - so indicate the address of the current mailbox. Registration in the War Thunder - free of charge, as the game itself. Although the possibility for those wishing Donat course is provided. To play without registration War Thunder - enter the game by pressing one of the social networks. The choice of gamers offers 4 modes of PVE - mode (which allows enthusiasts heroes change the course of World War II), and 3 PvP modes: Arcade, historical and realistic. Let us examine them in detail. Arcade mode. will appeal to those who are just starting to play War Thunder online. This regime is the most simple operation, a plurality of markers to detect aircraft, automatic aiming system and a virtual assistant for difficult situations. Historic mode. is characterized by the fact that all the battles take place on real - world landscapes, detail recreated in the game War Thunder. 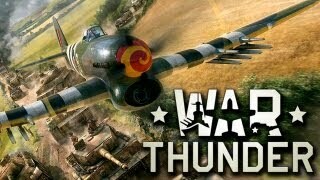 Accurately convey not only the topography of the territory - playing in the War Thunder in this mode, you will hear the real sounds of military equipment. Realistic mode. This option is for the brave and courageous. Realistic - is the most difficult game War Thunder Mode: here you will find a real cabin of the real aircraft with a million buttons and sensors to control. Identify planes will be the eyes, looking out of the cockpit of his fighting birds. Carefully designed damage model: if you struck the tank with fuel - can only catapult. Balance fights also as close to reality: so slow Soviet Ishachok never catch up with the German Messer (unless you're lucky with the critical hit), but in general - is to find the opponent's strength. You available 5 countries and their combat vehicles - the Soviet Union, the United States, Japan, Germany and the United Kingdom. Each plane its own unique style. 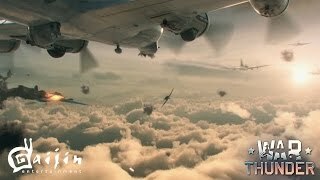 Shturmoviki heavy aircraft with a mass of weapons (bombs, rockets, machine guns) - on the universal battle. Fighters- light and maneuverable, cope with almost any aeronautical purpose. Also they can keep the air -to-ground combat. Bombers - heavy and very dangerous opponents, but cumbersome and require a cover. Torpedonostsy- intended for battle on the water with air, for that they have torpedoes, bombs and mines. Amfibii or seaplanes- military version - also bear the torpedo power, and can land on the water. To begin playing the game War Thunder - choose the nation for which you fight, and go! If your plane was shot down in battle and caused critical damage - will have to start the tour again. You are waiting for a variety of military tasks, such as the capture of airfields, reflect enemy attacks, and performing quests, for which you can earn points to upgrade the aircraft. Do not neglect the command battles - strategically they are winning. In game store you can buy equipment to improve both the aircraft and the crew skills. 2 is used for this currency: silver lions (the money received for the execution of missions) and golden eagles (the currency bought for real money).